What is Yarn in Textile? In textile industry, yarn is a long continuous length of interlocked fibres which is suitable for using in the production of textiles, sewing, crocheting, knitting, weaving, embroidery and rope making. If we broadly classify from the state of fibers, which from the yarn, we find that there is yarn of continuous fiber, which is made by putting together the long fibers such as raw silk, rayon and synthetic fibers etc. The second variety is the yarn of discontinuous fiber, in which short fibers like cotton, wool, hemp and staple fiber etc. are arranged in parallel state and bound together by giving twists. In case of the former one, the form of long fiber itself is the yarn. But, in case of the latter one, the operation of binding together short fibers is required. This operation is known as spinning and the yarn, which is made through this operation, is termed as spun yarn. 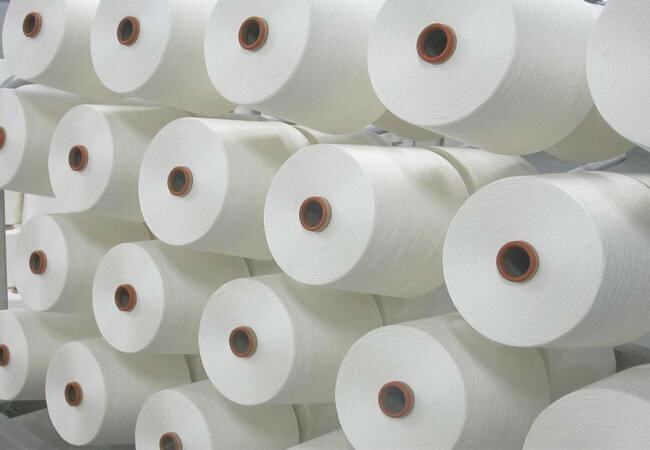 According to the fiber variety, spinning can be divided into cotton spinning, wool spinning, hemp spinning, silk spinning and staple fiber spinning etc. however, the basic theory of spinning is same for all. The only difference is that different machines, which would suit the properties of the particular fibers, are used. Depending on its variety of raw material, the yarn comprises varieties like raw silk yarn, silk yarn, rayon yarn, synthetic yarn, cotton yarn, woolen yarn, hemp yarn, spun silk yarn and staple fiber yarn etc. The yarn, which is spun by mixing together more than two varieties of fibers is termed as mixed spun yarn. The yarn, which is made by twisting together more than two yarns of different raw materials, is termed as mixed ply yarn or composite yarn. The single spun yarn is known as single yarn. When two of these are twisted, it is known as twin ply yarn or double yarn. For example, the yarn having the twists of two single yarns of 20 counts is termed as 20 no. twin ply yarn and it is shown in writing as 20’s/2 (mainly in case of cotton yarn) or 2/20m/m (in case of woolen yarn). If single yarn is made into twin ply yarn, usually the strength increases 3 times. The fabrics of single yarn are soft but they have no body. The fabrics of twin ply become hard but they have body and have a clear texture. Besides the twin ply, there are 3 ply, 4 ply or multiply ply yarns made according to the requirement. Such yarns made from single yarns of 20 counts are shown in writing as 20’s/3, 20’s/4 or 3/20’s, 4/20’s etc. Though there are some differences in yarns giving a number of twists is a normal practice. The yarn, which is given special, hard twists, is known as hard twisted yarn. The yarn with few twists is called as soft twisted yarn. But their boundaries are not specified clearly in number. For example, the yarn, having hard twists like the weft of crepe or cotton crease, is termed as hard twisted yarn. The things like knit-work yarn etc. are known as soft twisted yarns. The knit –work yarn has very low twists in comparison to the normal spun yarn. It is made into a soft and fluffy yarn. There are various divisions as per the usage but the greatest differences is shown by weaving yarn (yarn for woven fabrics) and the knitting yarn (yarn for knit work). Next to it are the comparatively important things like the stitching thread, embroidery thread and the lace thread etc. The procedure of making all these differs somewhat according to their and use and each one has its own special characteristics. There is also decorative thread called as fancy yarn, used for special purposes.